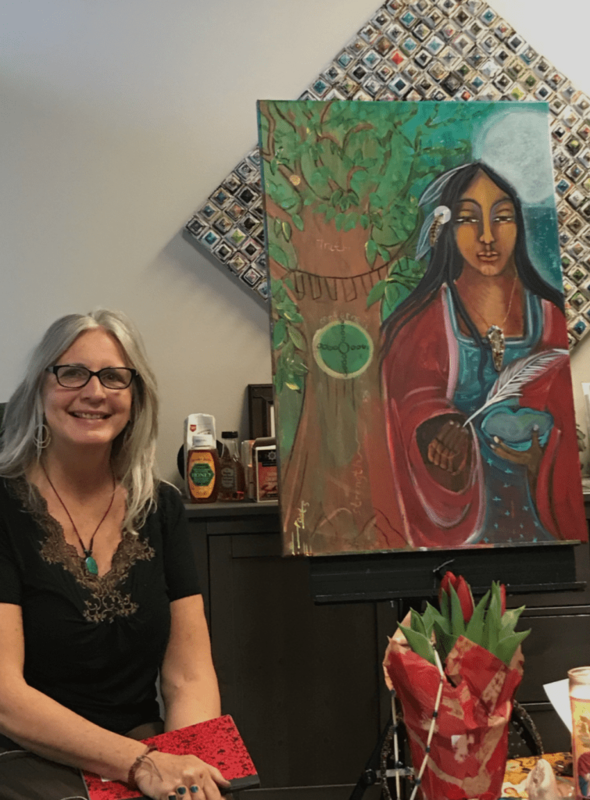 Olivia Oso shares her teaching journey of remembering our innate beauty and wisdom. 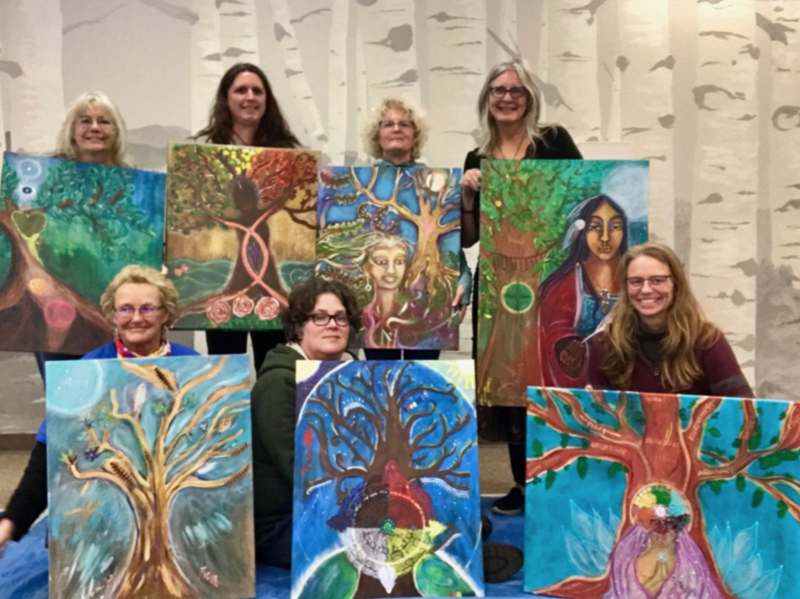 We gathered together in Eugene for the Sacred Tree Workshop and had an amazing time together. In the beginning of this painting process, all the elements where brought in to create the background. I asked the group to consciously listen to how each force lives within, earth, air, water and fire. A mark for a seed was added, representing the beginning of each person’s inner Tree of Life. We brought in the unavoidable tragedy line, as well as consciously acknowledging all the blessings and triumphs of our lives as well. A symbol to the Indigenous nature we EACH carry in own lineage and/or from the place where WE now live was added. I brought in ritual each day using Palo Santo, sage and rose quartz, with each participant receiving a gift of their own stick of Palo Santo along with a journal. I offered other oils from the plant nations to bless their canvases, lavender, cedar, and sage. Each person was also invited to bring a symbol of their sacred intention and we created a community altar together. 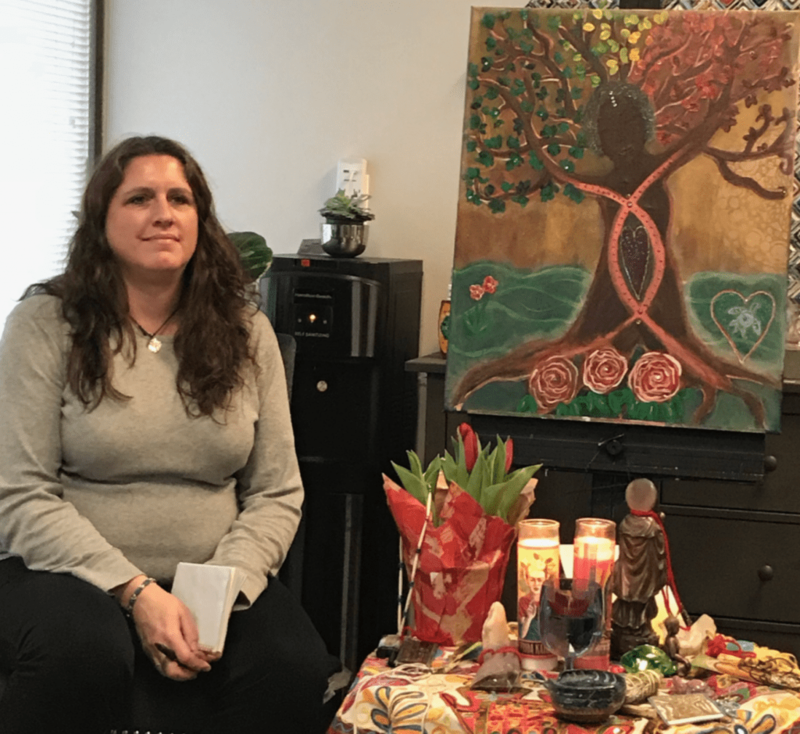 My teachings involved information from the different spiritual traditions and I shared different perspectives as they connected to what it represented for them personally. 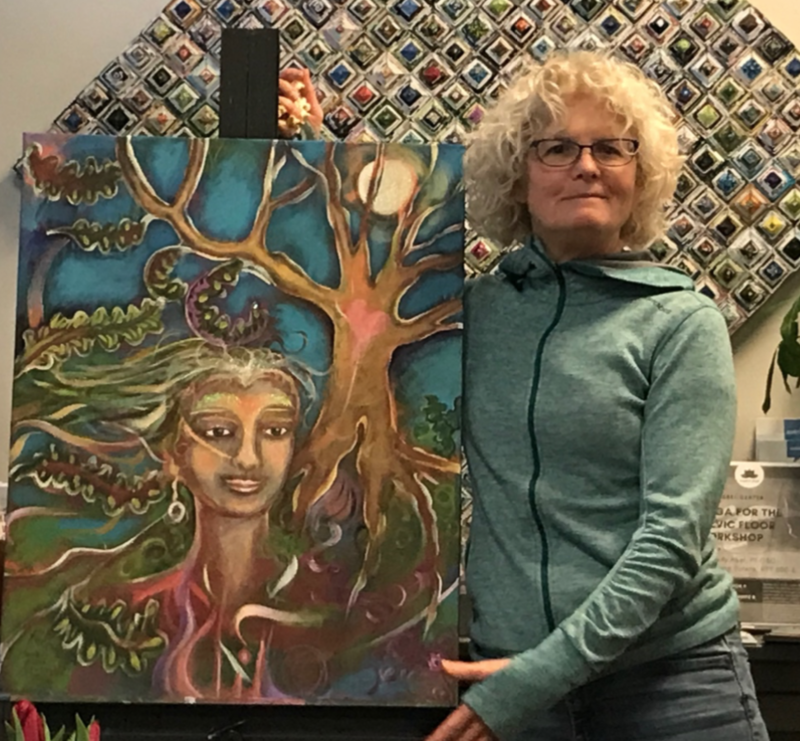 I also used the symbol and parts of the Tree as aspects of our own body such as, roots, truck, core, branches, leaves, flowers, inviting inquiry into what they represented in their own lives. Poetry was also used along the way. 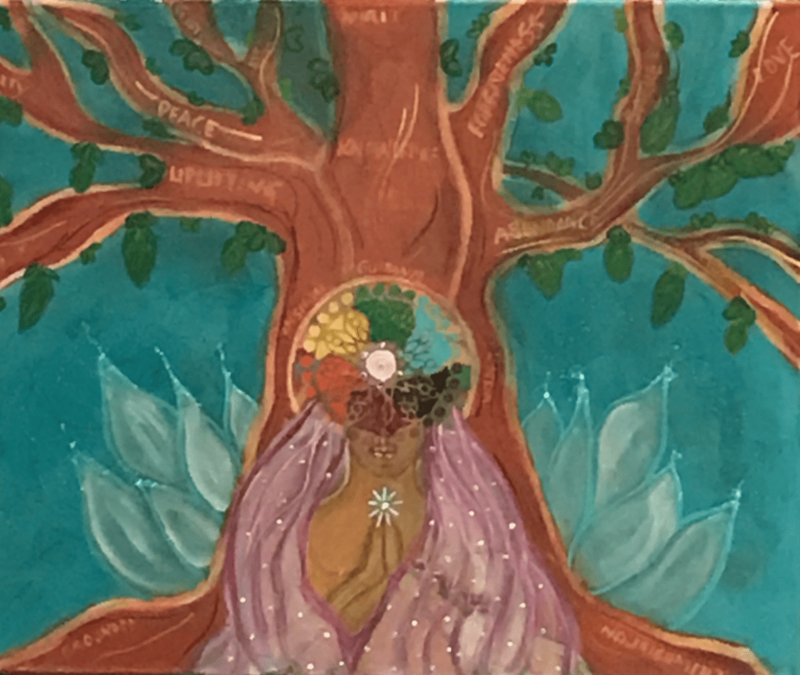 In a guided visualization, I took them down into the roots of the tree to the core of Mother earth and up their spine with the chakra points, to a connection with Her, a woman who was a spiritual presence for them. When I illustrated my Composition, I was guided to bring both the Feminine form and the Tree of Life. Attendees could choose whatever they wished or were guided to do, specifically a tree or a Being, along with the Sacred Tree. Over the course of 2 1⁄2 days, my Beloveds were so wonderful to be with. As feelings of fear, grief, being stuck or blocked and being terrified were expressed, in spite of these emotions, there was such trust and openness to the process. As a facilitator of the Intentional Creativity process, It was a wonderful gift and blessing to witness the break-downs, breakthroughs, aha moments, celebration and expression of Creativity. It is always so amazing to remember why I do this work. It makes such a difference in the world. We all got to witness as the energy of the group shifted, as things got released, new stories created and joy expressed. My passion is to guide others toward their inherent gifts in creative process. I love witnessing the Beauty of the earth in all Her many forms. I facilitate workshops and classes using Intentional Creativity in Portland, OR and beyond.